How cool would it be to control the cursor on your screen with just your finger and thumb instead of your whole hand? Think about it – you wouldn’t have to take your whole hand off of the keyboard to make a quick selection with your mouse or trackpad. 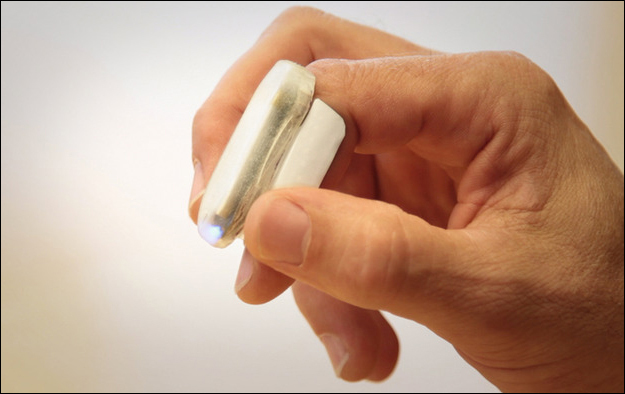 According to TechCrunch, this could soon be a reality thanks to the Mycestro, a wireless mouse with three discreet buttons that you wear on your index finger. Like most tech that falls under the category of “totally awesome if it works,” there’s a Kickstarter campaign for the Mycestro, and, so far, it’s doing well. With 38 days to go, the campaign has raised over $43,000 towards its goal of $100,000. A white Mycestro is available for $79, and colored ones are available for $99, though neither are estimated to ship until October. Like all Kickstarter projects, you’ll only be charged and receive the Mycestro if the project reaches its funding goal. Considering how much time is left, we’re guessing the goal will be easily met. The Mycestro looks like an oblong ring that wraps around your right index finger with three small, touch-sensitive buttons that work as left, middle, and right individual mouse buttons. Swiping your thumb along all three activates scrolling. To actually control the on-screen cursor, you’ll have to wave your finger around in front of you – which won’t make you look crazy at all – as long as you’re camped out at home … alone. The movements necessary for conducting with the Mycestro are reminiscent of many of the gesture-controlled computers and add-ons that have recently come out, such as Microsoft’s Kinnect, and The Leap, a $69 peripheral that attaches to any computer and allows it be controlled without touching it. Though we haven’t had a chance to try it yet, the Mycestro seems to be designed for more exacting control over your desktop instead of broad swiping gestures. Can’t wait to get a Mycestro around your finger? Check out the video of the Mycestro in action below.